As I have explained previously, my mum taught me how to sew. She also taught me how to cook, and she was usually quite happy to let me loose in the kitchen, without worrying that I would blow myself up or burn the house down. In fact, it could be due to some of her mis-haps in the kitchen that I haven’t (yet, touch wood) made similar errors. Of course, there was the time aged 6 or 7 that I broke the kettle, by failing to put water in it, but I only did that the once. Oh, and there was also the time that I made chocolate fairy cakes, and forgot to put sugar in…the look of them was well, – probably best not to dwell on that! 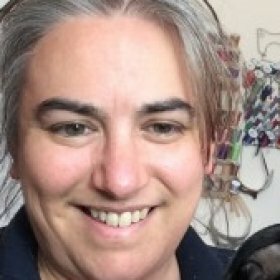 I will never forget the time that she used the stock from a ham she had boiled to make risotto (she didn’t have any other stock cubes in the house)…the resulting dish was grey and very salty. Nor will I easily forget the times (yes, more than once) when she cooked giblets for the cats, and forgot to turn off the hob. The smell was (thankfully for you, the reader) indescribable. 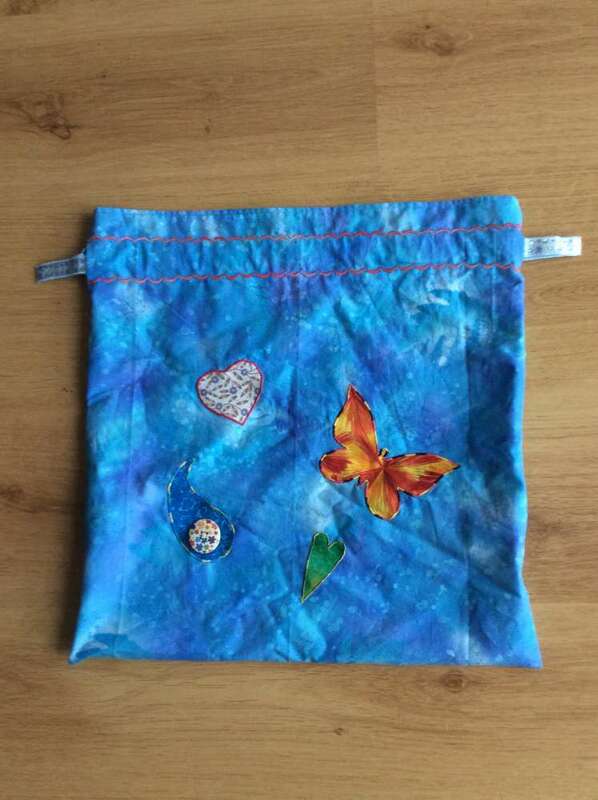 The first drawstring bag I ever made was for a foster child, and I made it as a laundry bag, so that the dirty laundry could go in there, rather than be left all over the floor. 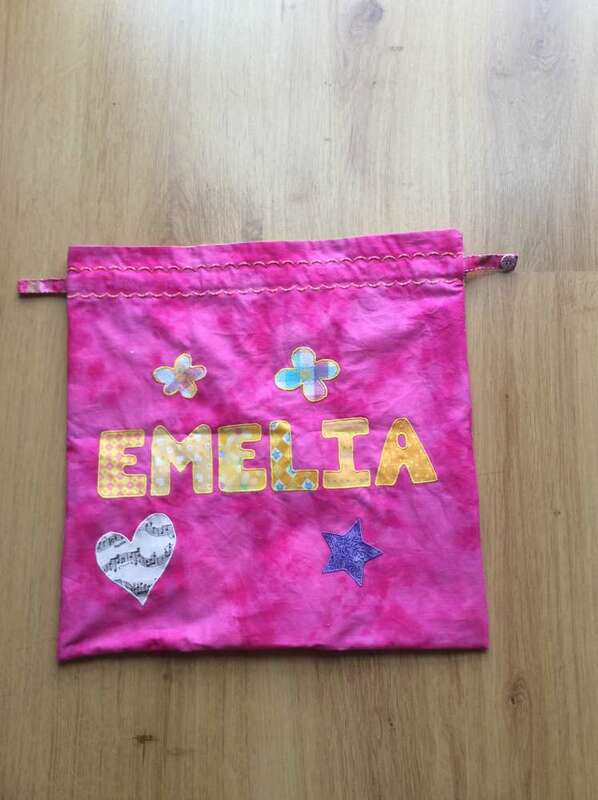 The second bag, was for one of my nieces. 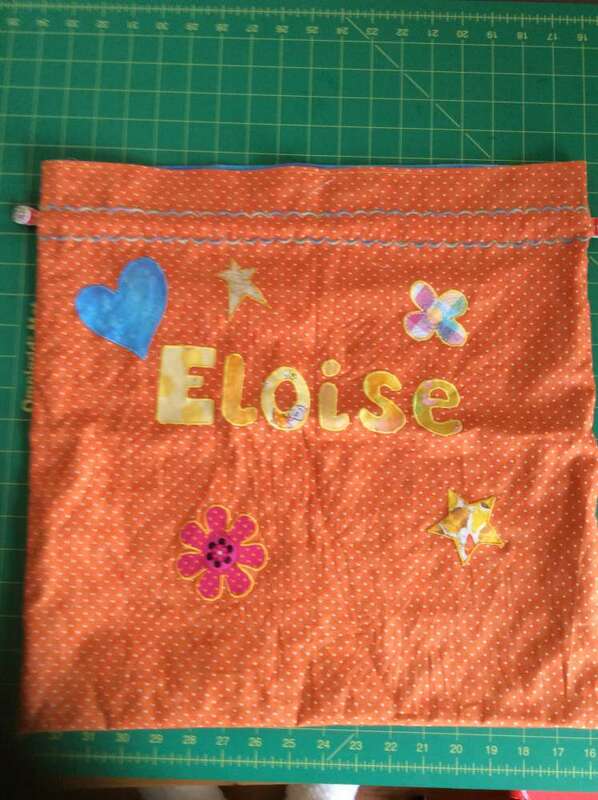 I had some idea as to the colour to use, and I made it a lined bag, and decorated it with her name on both sides – on one side entirely in upper case letter, the other with lower case letters as well. 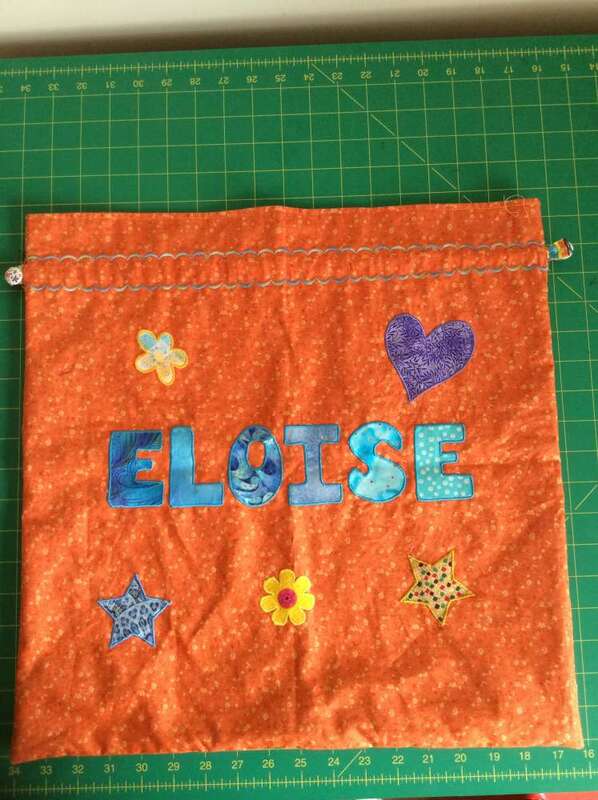 I could have included the alphabet with my pattern, but as another blogger and bag maker has intended to include an alphabet, I have chosen not to include one as well. 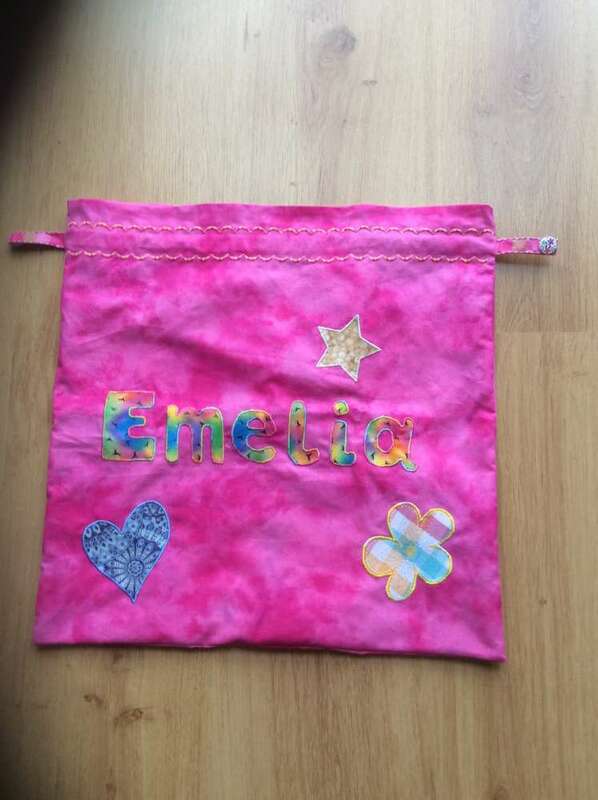 As it was only natural to ask me to make a bag for my niece, it was only too natural to ask me to make one for her sister as well, and I was able to ascertain the colours that I should use for both of the bags. One of them likes pink and the other likes orange. The decorations I used on these two bags were a combination of elements; I have made Christmas stockings for each of my grandchildren, and so I have a selection of shapes cut out already, that I had previously cut out templates for. I also used my Sizzix Big Shot and Bigz dies to cut out shapes – the hearts and the stars. The flowers were some that I had cut out previously for a Calendar Quilt project in British Patchwork and Quilting – a block which used the Broderie Perse technique. This needed me to cut out a variety of flowers, and I went a little bit mad with this (in that I did it to excess), so that I had a variety to choose from – after all, they tell us that variety is the spice of life! As a result – I was left with quite a lot of flowers left over – which are great for adding interest to projects. 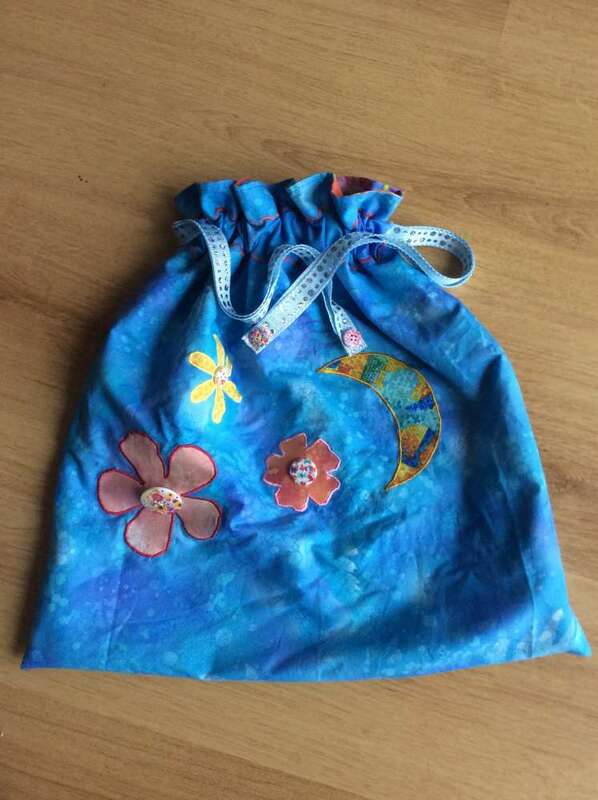 Another aspect of this drawstring bag – I’ve used ribbon for the drawstring; this is because I like pretty things, and I also have an inclination for things tactile. In order to secure the ends of the ribbon, I used buttons to create a tab; this adds detail and interest to the drawstring, it uses up some of those buttons that we all seem to accumulate (don’t deny it, you have a button collection – and can’t help buying those that are pretty, but don’t know what you are going to do with them), and they are easy for little fingers to grip. These bags are quick to make – the decoration may take you longer. I have had quite a few years of practice in machine satin stitch, to the extent that I have set a personalised stitch on my machine for the ideal satin stitch. I know that I have to tweak these settings a little, if I use rayon thread for the satin stitch; I like to use the rayon threads as they have a lovely sheen to them. The decorations can be personalised – fabrics with footballs on them can be fussy cut, so that you only have the football. Another option is to use pictures from the internet and print them on fabric (be careful as regards copyright infringement) – and then cut out the design. Examples for this may include football club logos, superhero logos. The channel for the drawstring is an ideal opportunity to use some of the decorative stitches that your sewing machine offers – and also to play with some of the settings; if your sewing machine allows it, you can mirror image the design (as can be seen in the bags for my nieces), and some machines allow you to elongate the patterns as well. If your machine doesn’t have a myriad of decorative stitches, you could use a wide zig-zag stitch with a variegated thread. If you are hand-stitching the channel, this is an ideal opportunity for practising your hand-embroidery: perhaps a whipped or laced running stitch, a cross stitch, or something else that takes your fancy. This challenge that I signed up for – creating bag patterns has not stretched me so much, as I have used bags that I have created previously. However, it has stretched me to come up with the patterns. It has also shown me that I can adapt ideas that others have had, and it has shown me that I can come up with ways to create what is asked of me without having a pattern to follow. The biggest thing I have learned is that if I can picture it in my head, I can find a way to create it! The other side of the project bag.